Former NFL wide receiver Jeremy Maclin has announced his retirement from the NFL, according to Mike Garafolo of NFL.com (Twitter link). Maclin, 30, was released by the Ravens last March but still expressed an interest in continuing his career in 2018. 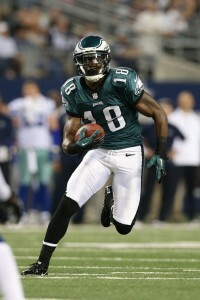 He didn’t garner any looks in free agency, however, although the Eagles were reportedly monitoring his status. Maclin’s health was an issue, as he suffered a hamstring/glute injury during a training session that required surgery in October. That ailment ruled him out for the 2018 campaign, and may have contributed to Maclin’s decision to hang up his cleats. A first-round pick of the Eagles in 2009, Maclin averaged 64 receptions and 864 yards per season before breaking out in 2014, when he posted 85 catches for 1,318 yards and seven touchdowns. That performance landed him a five-year, $55MM contract with the Chiefs, and Maclin’s success continued in his first go-round in Kansas City, as he managed a 85/1,088/10 line. In 2016, however, Maclin missed four games and failed to top 50 receptions or 600 yards receiving, and the Chiefs cut him after only two years. He landed with the Ravens on a two-year deal, but his results in Baltimore resembled his final year in Kansas City, leading to his release. PFR extends its best wishes to Maclin and his family as he enters post-NFL life. Agree he couldn’t of ever got hurt in Philly. He stopped playing years ago. The story leaves out the JMac called it quits at his wife’s baby shower. Good luck and thanks for the memories!